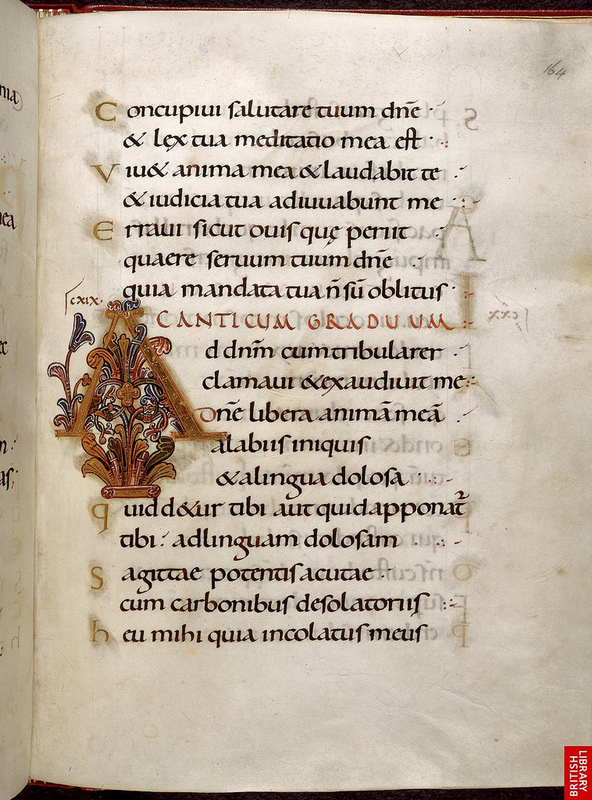 The Ramsey Psalter (BL, Harley 2904) is a masterpiece of the tenth century; it was the manuscript identified by Master Calligrapher Edward Johnston at the beginning of the last century as a good example of strong letter-forms to start to learn calligraphy. 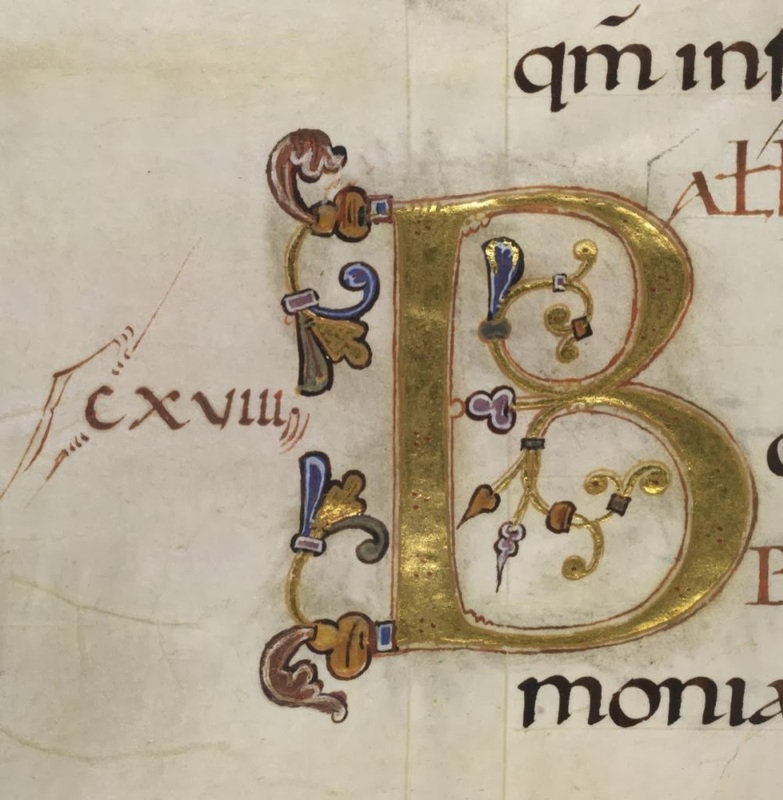 Psalm 1 in the psalter begins with a huge gilded B and this is then followed by enlarged capital letters for (B)eatus Vir qui non abiit in consilio imporum (Blessed is the Man who walketh not in the path of the ungodly …), see right. 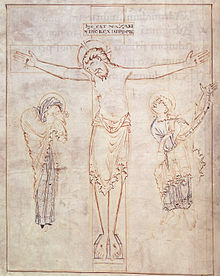 Opposite this majestic page is a wonderfully delicate line drawing of the crucifixion with Mary and John the Evangelist. The economy of line is truly admirable. The artist also contributed to Harley 2506 which you can see here. The Ramsey Psalter was written in Winchester in the last quarter of the tenth century, and is reputed to have been produced for St Oswald who became Bishop of Worcester in 961.For more about St Oswald and the manuscript, the Clerk of Oxford website has a great article here. 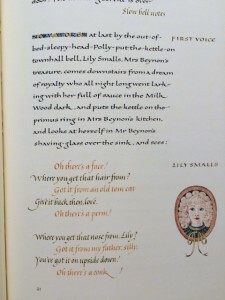 The script is English Caroline Minuscule; the forward slant, small x-height and elongated ascenders and descenders of Caroline Minuscule have been changed. 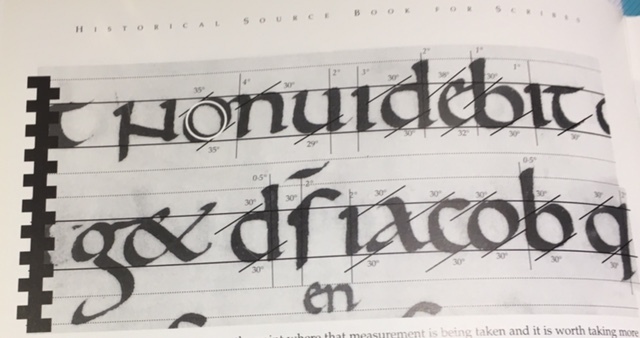 Once across the Channel, the x-height has increased, ascenders and descenders decreased, and the letters are upright resulting in a grander script perhaps. Edward Johnston developed an analysis of scripts by looking at 7 aspects of letters such that they could be copied. Here is my analysis of the Ramsey Psalter using Johnston’s 7 points (taken from the Historical Source Book for Scribes, I have a limited number of copies so do contact me through my website if you would like to buy one). 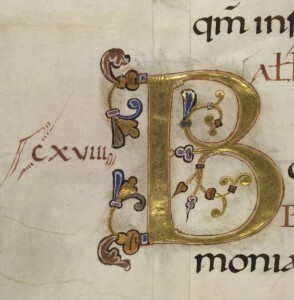 There are superbly executed smaller gilded and decorated initials, as here. 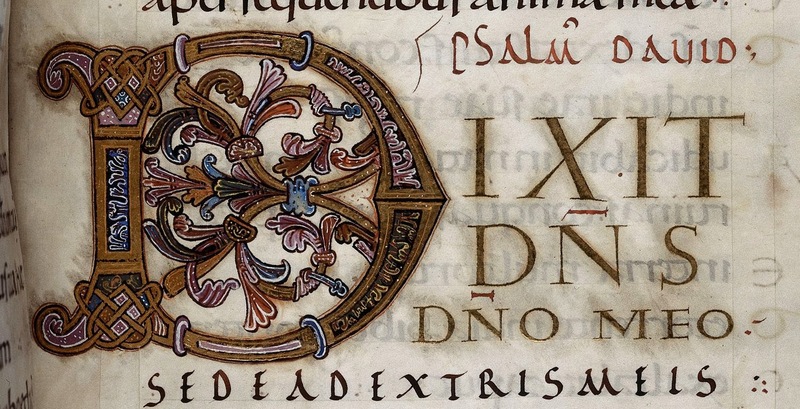 Psalms start with an enlarged gilded initial, and then verses begin with a smaller gilded letter, followed by the grand text script. Explicits and incipits were written in Rustics. The gilded Square Roman Capitals starting each psalm are particularly fine. What is intriguing to me is the slight darkening around the small gilded initials. I have a theory – it could be excess gold leaf being scraped off, or it could be the stickiness in the gesso leaching out. My preference is for the latter. To see the whole book click here. 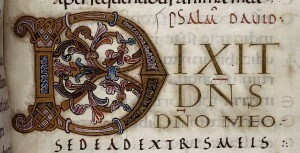 This entry was posted in Blog, Calligraphy and lettering, Lettering, lettering, Manuscripts and tagged BL Harley 2904, British Library, caroline minuscule, Clerk of Oxford, English Caroline Minuscule, Historical Source Book for Scribes, illuminated initials, Ramsey Psalter, St Oswald of Worcester on 22 November 2016 by Patricia. Please note: I am not now selling this book but have left this post up for interest. 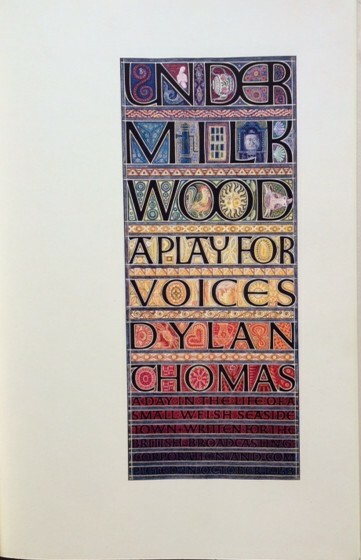 Once in a generation you come across a real tour-de-force, a masterpiece, and this is the case with Sheila Waters’ illustrated and calligraphic interpretation of Dylan Thomas’ Under Milk Wood. It is simply stunning! 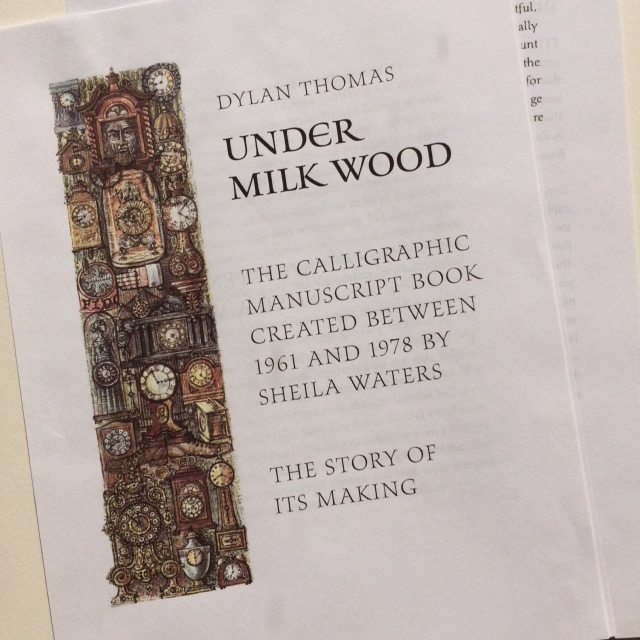 In the accompanying notes to the book Sheila writes: I realised that the manuscript I was making would be a legacy that I would leave behind, that should long outlast me …. 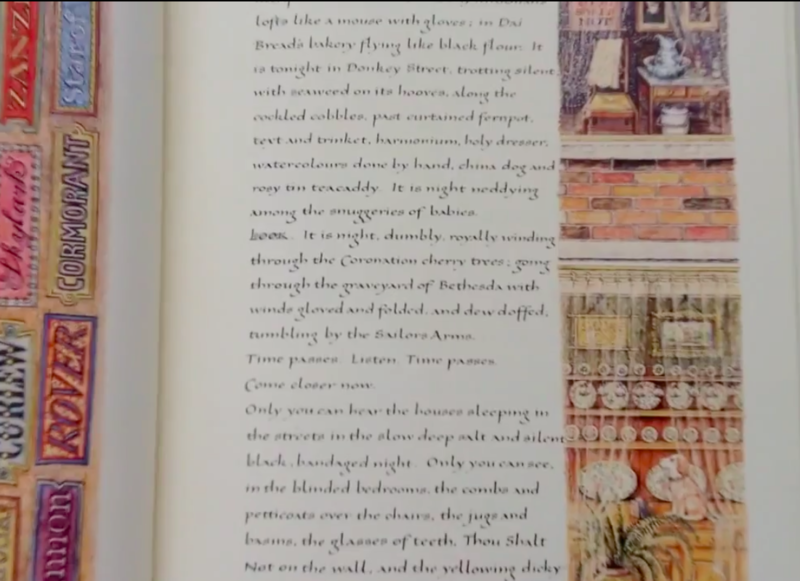 To have a sneaky peek inside the book, here is a short clip. *****PLEASE NOTE: I am not now selling this book so please contact Sheila directly. 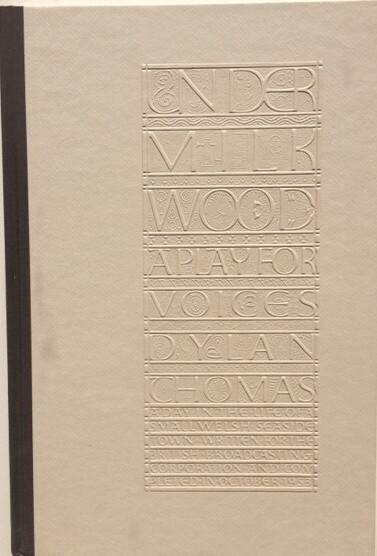 The cover of the book is stunning, with an impressive blind embossed panel on ivory paper (above). 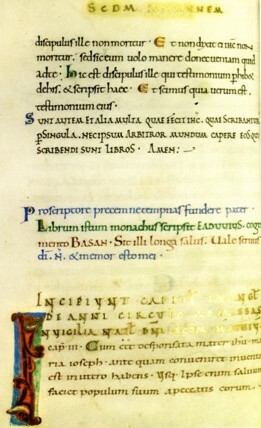 This panel is repeated inside the book, with Sheila’s typical majestical Roman Capitals in black with intricate drawings and vibrant colours as shown on the right. This panel alone took Sheila a month to design and execute. 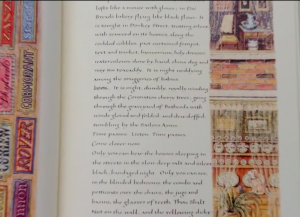 She took a long while to decide on the most appropriate writing style, and the accompanying notes about the book have examples of some of the lettering that Sheila considered and then rejected. 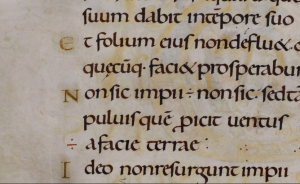 Her final choice was a neat, very slightly sloping formal hand based on that in the 9th-century great bibles mainly from Tours in France – Caroline Minuscule. Being Sheila, though, it has been given a modern twist and her own distinctive style. 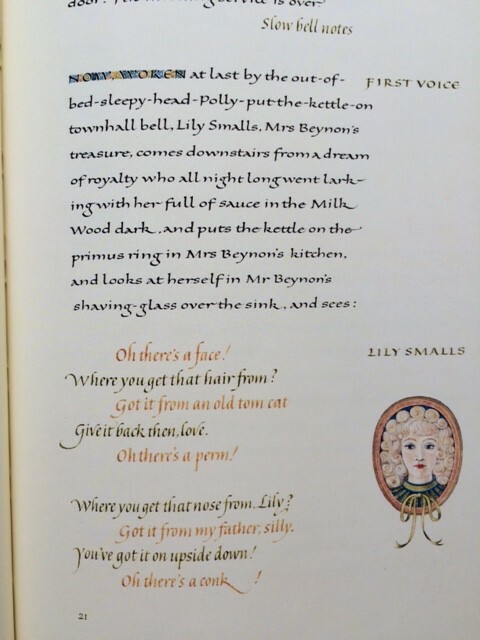 This contrasts, on some pages, with a delicate light Italic for selected parts of the text. 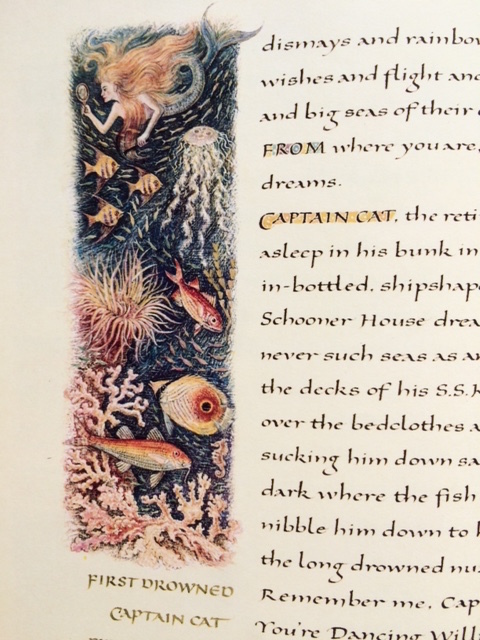 Sheila chose black and a specific limited colour scheme for the opening spreads, which was echoed in the layout of the pages. The one on the right is one of the green pages where the text columns are towards the centre of the book. This page also shows one of the extraordinarily detailed illustrations – Captain Cat and his dreams. 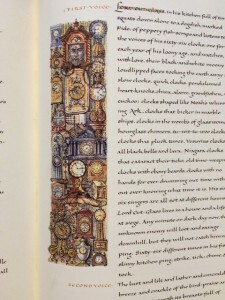 In the text Lord Cut-Glass owned 66 clocks ‘all set at different hours’, imagine trying to illustrate all of them! 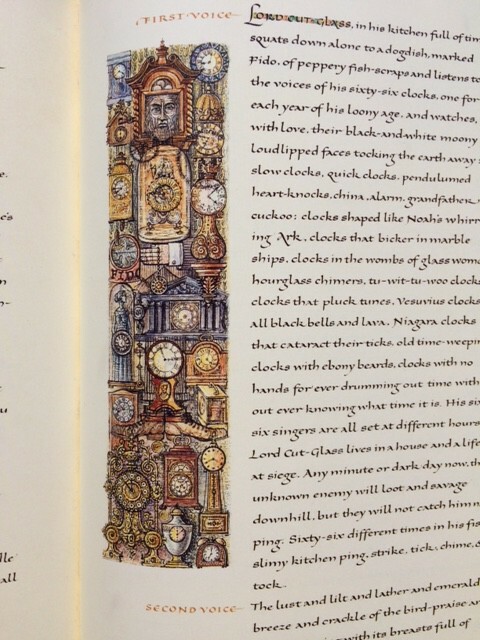 Sheila chose 22 clocks, all different and all authentic – and created an amazing design. Note Lord Cut-Glass’s face peering out of the grandfather clock at the top, his hand just above half-way holding a pocket watch, and his boots supporting the base of another clock. Ingenious! This book is so much more than a sum of its parts. 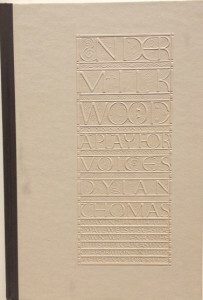 Dylan Thomas’ words are simply wonderful, but to have them written here in such a way, and illustrated so inventively and skilfully too, means that the result is a real joy and such a treat for the eyes. This is not a cheap offer, but it is a chance to treat yourself in a big way, and own what just has to be one of the true manuscript masterpieces of the twentieth century. 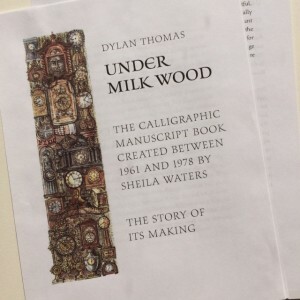 This entry was posted in Blog, Calligraphy and lettering, Interesting stuff and tagged calligraphy, caroline minuscule, Sheila Waters, Under Milk Wood on 18 October 2015 by Patricia. Eadui Basan – Edwin the Fat or Parchment? 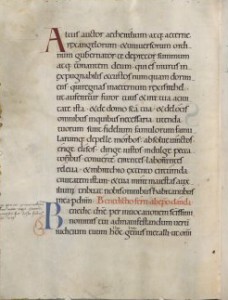 Eadui Basan was a monk who worked from Canterbury in Kent during the earlier part of the eleventh century, and his distinctive hand has been identified in a number of manuscripts. 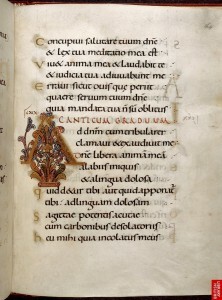 One of the ones I particular like is that of the Eadui Psalter, on the right. The whole page is united by the arched and pillared frame, yet divided by two lower arches. The hand of God holding a scroll with text is giving a blessing at the top, and blue lines indicate the heavens. Within the right-hand lower arch the monks of the foundation are shown in outline. This wasn’t because the artist ran out of ink or time, but it was the stye to colour people in outline only as they weren’t worthy of full-colour painting. In the left-hand arch sits St Benedict, and around his halo is written in Latin ‘St Benedict Father of the Monastery’. The saint sits resplendent in full colour, his hands open in blessing, with lots of gold leaf. At his feet is a small, kneeling figure grasping the feet of St Benedict and holding a book, again in full colour. There is no halo or other indication of sainthood so we must presume that he isn’t; around his waist is a belt on which is written ‘zone of humility’, and yet he is in full colour! It has been presumed that this is in fact the scribe of the book – Eadui Basan. 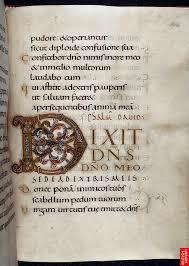 Eadui also worked on the Harley Psalter, another fascinating book (though what mediæval manuscript isn’t? 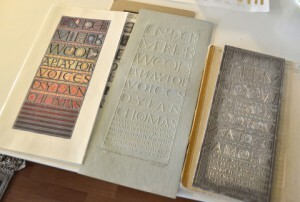 ), and the Grimbald Gospels, on the right. This shows his wonderfully clear script, and stunning gilded initials. Many will be familiar with the rounded letter-forms of Caroline Minuscule, which have a low x-height – often of only 3 nib widths – long ascenders and descenders, and a distinctly forward slant. 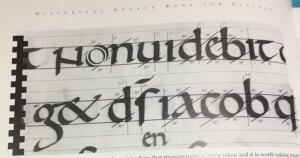 A little later in time and across the English Channel, scribes slightly extended the x-height to 4 nib widths, but reduced the ascenders and descenders; they also made it more upright. Examples of English Caroline Minuscule are in the British Library’s Ramsey Psalter (Harley 2904) written in the last quarter of the tenth century. Some decades later, Eadui Basan takes this hand and runs with it. He forms letters based on an oval letter o, rather than a round one, and extends the ascenders and descenders creating the most wonderfully fluid writing style. Another impressive book is the Corpus Christi Pontifical, right. A pontifical is a book of instructions for a bishop or archbishop including details on how to consecrate a church, ordinate a bishop, and even how to conduct a coronation. 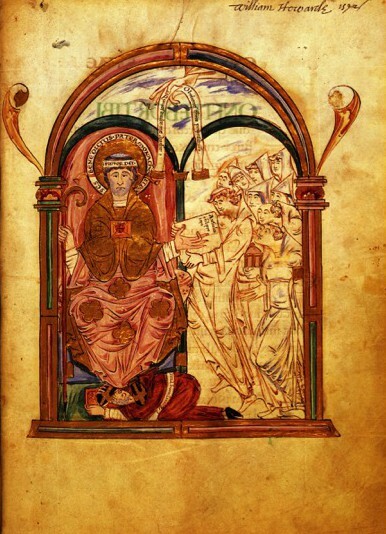 It is just possible that this book was used by Stigand, the Archbishop of Canterbury to crown Harold Hardrada in 1066 and also Ealdred, Archbishop of York for William the Conqueror. The characteristic regular and rhythmic script contrasts with the coloured Versal initials. 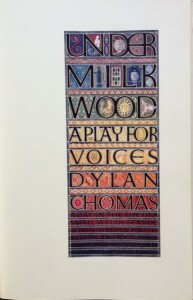 It is a most pleasing book and one of the gems at the Parker Library. It has been conserved and re-bound in recent years in the most vibrant red leather, how appropriate for a Pontifical! 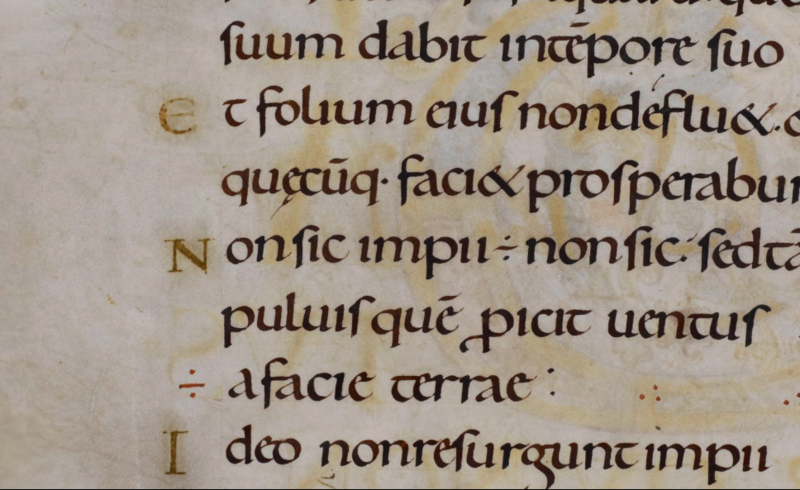 In the Eadui Codex, now in Hanover, we even have his ‘signature’, which is the coloured paragraph in the middle of the page right (and enlarged below): Pro scriptore precem ne tempnas fundere pater. Librum istum monachus scripsit EADUUIUS cognomento BASAN. Sit illi longa salus. Vale seruus dei .N. 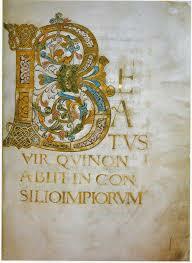 & memor esto mei (which has been translated as: Father do not neglect to say a prayer for the scribe. The monk who wrote this book EADUUIS second-named BASAN. Let there be to him long health. Good Health to the servant of God .N. and be mindful of me). So was he ‘fat ‘or was he ‘parchment’? I always understood that the Old English translation of ‘basan’ was ‘fat’ as in David Dumville’s English Caroline Script and Monastic History. 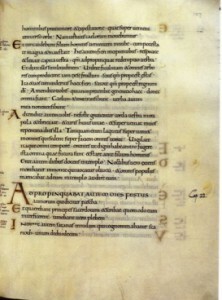 Studies in Benedictism, AD 950–1030. However a paper by Tracey-Anne Cooper has looked at the ‘surname’ and does not refer to the Old English translation but suggests instead a Latin one. She thinks that it could refer to the substrate used by Eadui for his books, and that ‘basan’ or ‘bazan’ or ‘bazin’ means ‘sheep-skin tanned in oak- or larch-bark’. Without wishing to split hairs, I would think that, with the craft processes so much more a part of their daily lives than now, those naming Eadui would be fully aware that the skins for parchment or vellum aren’t tanned as are those for bookbinding, shoes, bags or clothes, but treated in a completely different way. Yet another example of mediæval manuscripts sometimes presenting more questions than they answer! This entry was posted in Blog, Manuscripts and tagged Basan, calligrapher, Canterbury, caroline minuscule, Christ Church Canterbury, David Dumville, Eadui, Eadui Basan, Eadui Codex, Eadui Psalter, Edward the Confessor, English Caroline Minuscule, Grimbald Gospels, manuscript, pontifical, quills, Ramsey Psalter, St Benedict, vellum, William the Conqueror on 15 May 2015 by Patricia.